We are living in a golden age of innovation, where personalized medicine is making it possible to cure diseases that we never thought curable. Digital medicine is helping people with diseases get healthier, and we are constantly discovering how to use the body’s immune system to target and eradicate cancer cells. 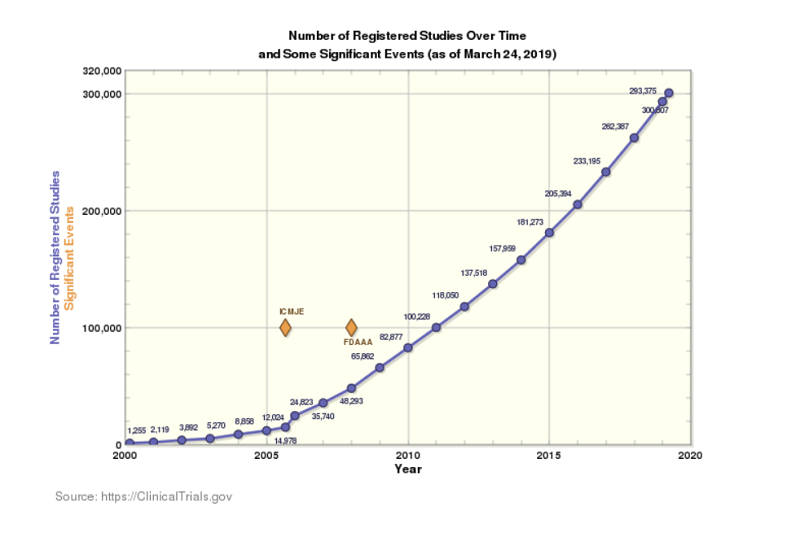 According to a report published by ClinicalTrials.gov, the number of registered studies hit 293,000 in 2018, representing a 250x growth since 2000. 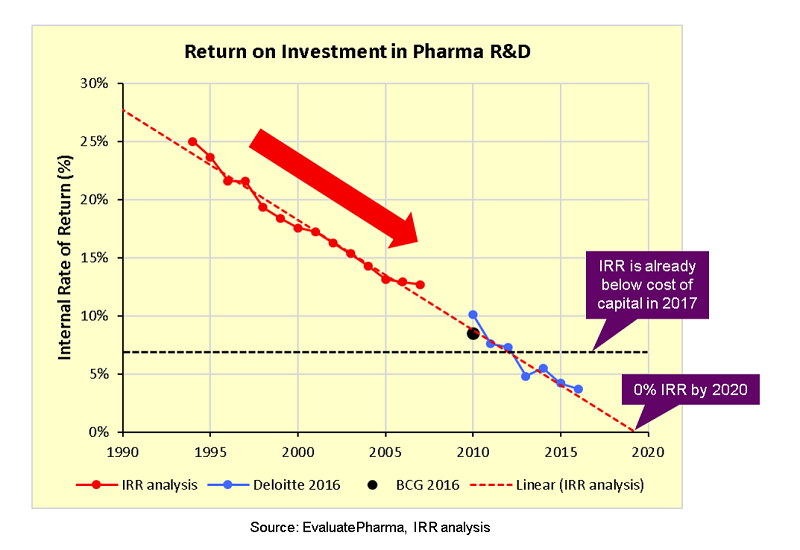 However, an internal rate of return (IRR) analysis by Endpoints News, using data from EvaluatePharma, highlights some interesting trends. A flourishing trend in pharma innovation is supported by strong growth in registered studies. However, the IRR shows a rapidly declining trend, from around 17 percent in 2000 to below the cost of capital in 2017 and projected to go to 0 percent by 2020. This blog post is the first installment in a series that focuses on the end-to-end workflow of collecting, storing, processing, visualizing, and acting on clinical trials data in a compliant and secure manner. The series also discusses the application of artificial intelligence and machine learning technologies to the world of clinical trials. In this post, we highlight common architectural patterns that AWS customers use to modernize their clinical trials. These incorporate mobile technologies for better evidence generation, cost reduction, increasing quality, improving access, and making medicine more personalized for patients. Biotech and pharma organizations are feeling the pressure to use resources as efficiently as possible. This pressure forces them to search for any opportunity to streamline processes, get faster, and stay more secure, all while decreasing costs. More and more life sciences companies are targeting biologics, CAR-T, and precision medicine therapeutics, with focus shifting towards smaller, geographically distributed patient segments. This shift has resulted in an increasing mandate to capture data from previously unavailable, nontraditional sources. These sources include mobile devices, IoT devices, and in-home and clinical devices. Life sciences companies merge data from these sources with data from traditional clinical trials to build robust evidence around the safety and efficacy of a drug. Early last year, the Clinical Trials Transformation Initiative (CTTI) provided recommendations about using mobile technologies for capturing holistic, high quality, attributable, real-world data from patients and for submission to the U.S. Food and Drug Administration (FDA). By using mobile technologies, life sciences companies can reduce barriers to trial participation and lower costs associated with conducting clinical trials. Global regulatory groups such as the FDA, Health Canada, and Medicines and Healthcare products Regulatory Agency (MHRA), among others, are also in favor of using mobile technologies. Mobile technologies can make patient recruitment more efficient, reach endpoints faster, and reduce the cost and time required to conduct clinical trials. Improvised data ingestion using mobile technologies can speed up outcomes, reduce costs, and improve the accuracy of clinical trials. This is especially true when mobile data ingestion is supplemented with artificial intelligence and machine learning (AI/ML) technologies. Together, they can usher in a new age of smart clinical trials. At the same time, traditional clinical trial processes and technology designed for mass-marketed blockbuster drugs can’t effectively meet emerging industry needs. This leaves life sciences and pharmaceutical companies in need of assistance for evolving their clinical trial operations. These circumstances result in making clinical trials one of the largest areas of investment for bringing a new drug to market. The AWS Cloud provides HIPAA eligible services and solutions. As an AWS customer, you can use these to build solutions for global implementation of mobile devices and sensors in trials, secure capture of streaming Internet of Things (IoT) data, and advanced analytics through visualization tools or AI/ML capabilities. Some of the use cases these services and solutions enable are finding and recruiting patients using smart analytics, facilitating global data management, and remote or in-patient site monitoring. Others include predicting lack of adherence, detecting adverse events, and accelerating trial outcomes along with optimizing trial costs. Clinical Trials 2.0 (CT2.0) at AWS is geared toward facilitating wider adoption of cloud-native services to enable data ingestion from disparate sources, cost-optimized and reliable storage, and holistic analytics. At the same time, CT2.0 provides the granular access control, end-to-end security, and global scalability needed to conduct clinical trials more efficiently. One of the typical architectures for managing a clinical trial using mobile technologies is shown following. This architecture focuses on capturing real-time data from mobile sources and providing a way to process it. * – Additional considerations such as data security, access control, and compliance need to be incorporated into the architecture and are discussed in the remainder of this post. Managing a trial by using this architecture consists of the following five major steps. Mobile devices, personal wearables, instruments, and smart-devices are extensively being used (or being considered) by global pharmaceutical companies in patient care and clinical trials to provide data for activity tracking, vital signs monitoring, and so on, in real-time. Devices like infusion pumps, personal use dialysis machines, and so on require tracking and alerting of device consumables and calibration status. Remote settings management is also a major use case for these kinds of devices. 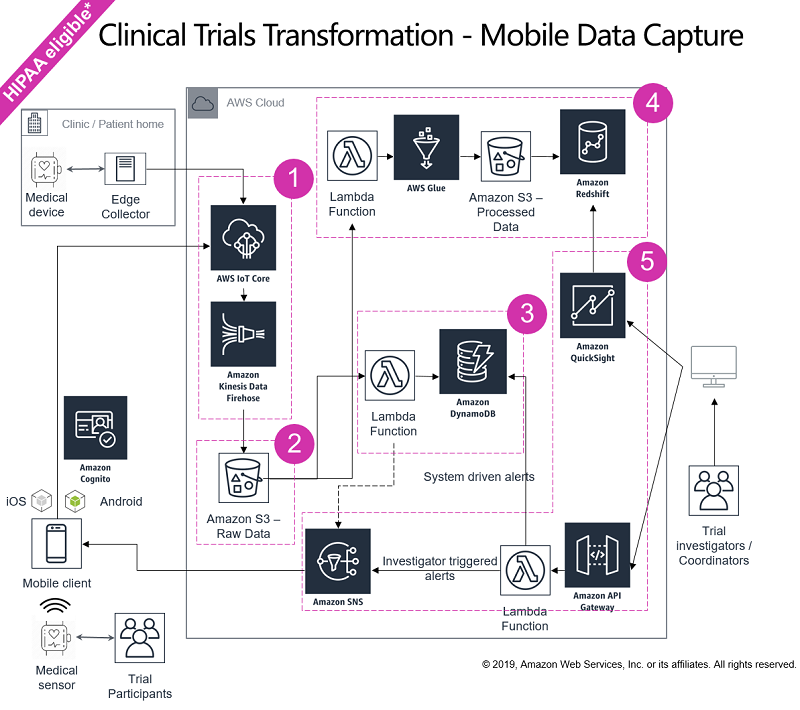 The end-user mobile devices used in the clinical trial emit a lot of telemetry data that requires real-time data capture, data cleansing, transformation, and analysis. Typically, these devices are connected to an edge node or a smart phone. Such a connection provides sufficient computing resources to stream data to AWS IoT Core. AWS IoT Core can then be configured to write data to Amazon Kinesis Data Firehose in near real time. Kinesis Data Firehose is a fully managed service for delivering real-time streaming data to destinations such as Amazon S3. S3 provides online, flexible, cost efficient, pay-as-you-go storage that can replicate your data on three Availability Zones within an AWS Region. The edge node or smart phone can use the AWS IoT SDKs to publish and subscribe device data to AWS IoT Core with MQTT. This process uses the AWS method of authentication (called ‘SigV4’), X.509 certificate–based authentication, and customer-created token-based authentication (through custom authorizers). This authenticated approach enables you to map your choice of policies to each certificate and remotely control device or application access. You can also use the Kinesis Data Firehose encryption feature to enable server-side data encryption. You can also capture additional data such as Case Report Forms (CRF), Electronic Medical Records (EMR), and medical images using Picture Archiving and Communication Systems (PACS). In addition, you can capture laboratory data (Labs) and other Patient Reported Outcomes data (ePRO). AWS provides multiple tools and services to effectively and securely connect to these data sources, enabling you to ingest data in various volumes, variety, and velocities. For more information about creating a HealthCare Data Hub and ingesting Digital Imaging and Communications in Medicine (DICOM) data, see the AWS Big Data Blog post Create a Healthcare Data Hub with AWS and Mirth Connect. After data is ingested from the devices and wearables used in the clinical trial, Kinesis Data Firehose is used to store the data on Amazon S3. This stored data serves as a raw copy and can later be used for historical analysis and pattern prediction. Using Amazon S3’s lifecycle policies, you can periodically move your data to reduced cost storage such as Amazon S3 Glacier for further optimizing their storage costs. Using Amazon S3 Intelligent Tiering can automatically optimize costs when data access patterns change, without performance impact or operational overhead by moving data between two access tiers—frequent access and infrequent access. You can also choose to encrypt data at rest and in motion using various encryption options available on S3. Amazon S3 offers an extremely durable, highly available, and infinitely scalable data storage infrastructure, simplifying most data processing, backup, and replication tasks. After collecting and storing a raw copy of the data, Amazon S3 is configured to publish events to AWS Lambda and invoke a Lambda function by passing the event data as a parameter. The Lambda function is used to extract the key performance indicators (KPIs) such as adverse event notifications, medication adherence, and treatment schedule management from the incoming data. You can use Lambda to process these KPIs and store them in Amazon DynamoDB, along with encryption at rest, which powers a near-real-time clinical trial status dashboard. This alerts clinical trial coordinators in real time so that appropriate interventions can take place. In addition to this, using a data warehouse full of medical records, you can train and implement a machine learning model. This model can predict which patients are about to switch medications or might exhibit adherence challenges in the future. Such prediction can enable clinical trial coordinators to narrow in on those patients with mitigation strategies. For historical analysis and pattern prediction, the staged data (stored in S3) is processed in batches. A Lambda function is used to trigger the extract, transform, and load (ETL) process every time new data is added to the raw data S3 bucket. This Lambda function triggers an ETL process using AWS Glue, a fully managed ETL service that makes it easy for you to prepare and load your data for analytics. This approach helps in mining current and historical data to derive actionable insights, which is stored on Amazon S3. From there, data is loaded on to Amazon Redshift, a cost-effective, petabyte-scale data warehouse offering from AWS. You can also use Amazon Redshift Spectrum to extend data warehousing out to exabytes without loading any data to Amazon Redshift, as detailed in the Big Data blog post Amazon Redshift Spectrum Extends Data Warehousing Out to Exabytes—No Loading Required. This enables you to provide an all-encompassing picture of the entire clinical trial to your clinical trial coordinators, enabling you to react and respond faster. In addition to this, you can train and implement a machine learning model to identify patients who might be at risk for adherence challenges. This enables clinical trial coordinators to reinforce patient education and support. After the data is processed and ready to be consumed, you can use Amazon QuickSight, a cloud-native business intelligence service from AWS that offers native Amazon Redshift connectivity. Amazon QuickSight is serverless and so can be rolled out to your audiences in hours. You can also use a host of third-party reporting tools, which can use AWS-supplied JDBC or ODBC drivers or open-source PostgreSQL drivers to connect with Amazon Redshift. These tools include TIBCO Spotfire Analytics, Tableau Server, Qlik Sense Enterprise, Looker, and others. Real-time data processing (step 3 preceding) combines with historical-view batch processing (step 4). Together, they empower contract research organizations (CROs), study managers, trial coordinators, and other entities involved in the clinical trial journey to make effective and informed decisions at a speed and frequency that was previously unavailable. Using Amazon QuickSight’s unique Pay-per-Session pricing model, you can optimize costs for your bursty usage models by paying only when users access the dashboards. Using Amazon Simple Notification Service (Amazon SNS), real-time feedback based on incoming data and telemetry is sent to patients by using text messages, mobile push, and emails. In addition, study managers and coordinators can send Amazon SNS notifications to patients. Amazon SNS provides a fully managed pub/sub messaging for micro services, distributed systems, and serverless applications. It’s designed for high-throughput, push-based, many-to-many messaging. Alerts and notifications can be based on current data or a combination of current and historical data. To encrypt messages published to Amazon SNS, you can follow the steps listed in the post Encrypting messages published to Amazon SNS with AWS KMS, on the AWS Compute Blog. At AWS, customer trust is our top priority. We deliver services to millions of active customers, including enterprises, educational institutions, and government agencies in over 190 countries. Our customers include financial services providers, healthcare providers, and governmental agencies, who trust us with some of their most sensitive information. To facilitate this, along with the services mentioned earlier, you should also use AWS Identity and Access Management (IAM) service. IAM enables you to maintain segregation of access, fine-grained access control, and securing end user mobile and web applications. You can also use AWS Security Token Service (AWS STS) to provide secure, self-expiring, time-boxed, temporary security credentials to third-party administrators and service providers, greatly strengthening your security posture. You can use AWS CloudTrail to log IAM and STS API calls. Additionally, AWS IoT Device Management makes it easy to securely onboard, organize, monitor, and remotely manage IoT devices at scale. With AWS, you can add an additional layer of security to your data at rest in the cloud. AWS provides scalable and efficient encryption features for services like Amazon EBS, Amazon S3, Amazon Redshift, Amazon SNS, AWS Glue, and many more. Flexible key management options, including AWS Key Management Service, enable you to choose whether to have AWS manage the encryption keys or to keep complete control over their keys. In addition, AWS provides APIs for you to integrate encryption and data protection with any of the services that you develop or deploy in an AWS environment. As a customer, you maintain ownership of your data, and select which AWS services can process, store, and host the content. Generally speaking, AWS doesn’t access or use customers’ content for any purpose without their consent. AWS never uses customer data to derive information for marketing or advertising. When evaluating the security of a cloud solution, it’s important that you understand and distinguish between the security of the cloud and security in the cloud. The AWS Shared Responsibility Model details this relationship. To assist you with your compliance efforts, AWS continues to add more services to the various compliance regulations, attestations, certifications, and programs across the world. To decide which services are suitable for you, see the services in scope page. You can also use various services like, but not limited to, AWS CloudTrail, AWS Config, Amazon GuardDuty, and AWS Key Management Service (AWS KMS) to enhance your compliance and auditing efforts. Find more details in the AWS Compliance Solutions Guide. With the ever-growing interconnectivity and technological advances in the field of medical devices, mobile devices and sensors can improve numerous aspects of clinical trials. They can help in recruitment, informed consent, patient counseling, and patient communication management. They can also improve protocol and medication adherence, clinical endpoints measurement, and the process of alerting participants on adverse events. Smart sensors, smart mobile devices, and robust interconnecting systems can be central in conducting clinical trials. Every biopharma organization conducting or sponsoring a clinical trial activity faces the conundrum of advancing their approach to trials while maintaining overall trial performance and data consistency. The AWS Cloud enables a new dimension for how data is collected, stored, and used for clinical trials. It thus addresses that conundrum as we march towards a new reality of how drugs are brought to market. The AWS Cloud abstracts away technical challenges such as scaling, security, and establishing a cost-efficient IT infrastructure. In doing so, it allows biopharma organizations to focus on their core mission of improving patent lives through the development of effective, groundbreaking treatments. This is a fun steganographic application: hiding a message in a fingerprint image. Can’t see any real use for it, but that’s okay. Earlier this month, I wrote about a statement by the Five Eyes countries about encryption and back doors. (Short summary: they like them.) One of the weird things about the statement is that it was clearly written from a law-enforcement perspective, though we normally think of the Five Eyes as a consortium of intelligence agencies. Susan Landau examines the details of the statement, explains what’s going on, and why the statement is a lot less than what it might seem. Quantum computing is a new way of computing — one that could allow humankind to perform computations that are simply impossible using today’s computing technologies. It allows for very fast searching, something that would break some of the encryption algorithms we use today. And it allows us to easily factor large numbers, something that would break the RSA cryptosystem for any key length. This is why cryptographers are hard at work designing and analyzing “quantum-resistant” public-key algorithms. Currently, quantum computing is too nascent for cryptographers to be sure of what is secure and what isn’t. But even assuming aliens have developed the technology to its full potential, quantum computing doesn’t spell the end of the world for cryptography. Symmetric cryptography is easy to make quantum-resistant, and we’re working on quantum-resistant public-key algorithms. If public-key cryptography ends up being a temporary anomaly based on our mathematical knowledge and computational ability, we’ll still survive. And if some inconceivable alien technology can break all of cryptography, we still can have secrecy based on information theory — albeit with significant loss of capability. At its core, cryptography relies on the mathematical quirk that some things are easier to do than to undo. Just as it’s easier to smash a plate than to glue all the pieces back together, it’s much easier to multiply two prime numbers together to obtain one large number than it is to factor that large number back into two prime numbers. Asymmetries of this kind — one-way functions and trap-door one-way functions — underlie all of cryptography. To encrypt a message, we combine it with a key to form ciphertext. Without the key, reversing the process is more difficult. Not just a little more difficult, but astronomically more difficult. Modern encryption algorithms are so fast that they can secure your entire hard drive without any noticeable slowdown, but that encryption can’t be broken before the heat death of the universe. With symmetric cryptography — the kind used to encrypt messages, files, and drives — that imbalance is exponential, and is amplified as the keys get larger. Adding one bit of key increases the complexity of encryption by less than a percent (I’m hand-waving here) but doubles the cost to break. So a 256-bit key might seem only twice as complex as a 128-bit key, but (with our current knowledge of mathematics) it’s 340,282,366,920,938,463,463,374,607,431,768,211,456 times harder to break. Public-key encryption (used primarily for key exchange) and digital signatures are more complicated. Because they rely on hard mathematical problems like factoring, there are more potential tricks to reverse them. So you’ll see key lengths of 2,048 bits for RSA, and 384 bits for algorithms based on elliptic curves. Here again, though, the costs to reverse the algorithms with these key lengths are beyond the current reach of humankind. This one-wayness is based on our mathematical knowledge. When you hear about a cryptographer “breaking” an algorithm, what happened is that they’ve found a new trick that makes reversing easier. Cryptographers discover new tricks all the time, which is why we tend to use key lengths that are longer than strictly necessary. This is true for both symmetric and public-key algorithms; we’re trying to future-proof them. Quantum computers promise to upend a lot of this. Because of the way they work, they excel at the sorts of computations necessary to reverse these one-way functions. For symmetric cryptography, this isn’t too bad. Grover’s algorithm shows that a quantum computer speeds up these attacks to effectively halve the key length. This would mean that a 256-bit key is as strong against a quantum computer as a 128-bit key is against a conventional computer; both are secure for the foreseeable future. For public-key cryptography, the results are more dire. Shor’s algorithm can easily break all of the commonly used public-key algorithms based on both factoring and the discrete logarithm problem. Doubling the key length increases the difficulty to break by a factor of eight. That’s not enough of a sustainable edge. There are a lot of caveats to those two paragraphs, the biggest of which is that quantum computers capable of doing anything like this don’t currently exist, and no one knows when — or even if ­- we’ll be able to build one. We also don’t know what sorts of practical difficulties will arise when we try to implement Grover’s or Shor’s algorithms for anything but toy key sizes. (Error correction on a quantum computer could easily be an unsurmountable problem.) On the other hand, we don’t know what other techniques will be discovered once people start working with actual quantum computers. My bet is that we will overcome the engineering challenges, and that there will be many advances and new techniques­but they’re going to take time to discover and invent. Just as it took decades for us to get supercomputers in our pockets, it will take decades to work through all the engineering problems necessary to build large-enough quantum computers. In the short term, cryptographers are putting considerable effort into designing and analyzing quantum-resistant algorithms, and those are likely to remain secure for decades. This is a necessarily slow process, as both good cryptanalysis transitioning standards take time. Luckily, we have time. Practical quantum computing seems to always remain “ten years in the future,” which means no one has any idea. After that, though, there is always the possibility that those algorithms will fall to aliens with better quantum techniques. I am less worried about symmetric cryptography, where Grover’s algorithm is basically an upper limit on quantum improvements, than I am about public-key algorithms based on number theory, which feel more fragile. It’s possible that quantum computers will someday break all of them, even those that today are quantum resistant. If that happens, we will face a world without strong public-key cryptography. That would be a huge blow to security and would break a lot of stuff we currently do, but we could adapt. In the 1980s, Kerberos was an all-symmetric authentication and encryption system. More recently, the GSM cellular standard does both authentication and key distribution — at scale — with only symmetric cryptography. Yes, those systems have centralized points of trust and failure, but it’s possible to design other systems that use both secret splitting and secret sharing to minimize that risk. (Imagine that a pair of communicants get a piece of their session key from each of five different key servers.) The ubiquity of communications also makes things easier today. We can use out-of-band protocols where, for example, your phone helps you create a key for your computer. We can use in-person registration for added security, maybe at the store where you buy your smartphone or initialize your Internet service. Advances in hardware may also help to secure keys in this world. I’m not trying to design anything here, only to point out that there are many design possibilities. We know that cryptography is all about trust, and we have a lot more techniques to manage trust than we did in the early years of the Internet. Some important properties like forward secrecy will be blunted and far more complex, but as long as symmetric cryptography still works, we’ll still have security. It’s a weird future. Maybe the whole idea of number theory­-based encryption, which is what our modern public-key systems are, is a temporary detour based on our incomplete model of computing. Now that our model has expanded to include quantum computing, we might end up back to where we were in the late 1970s and early 1980s: symmetric cryptography, code-based cryptography, Merkle hash signatures. That would be both amusing and ironic. Yes, I know that quantum key distribution is a potential replacement for public-key cryptography. But come on — does anyone expect a system that requires specialized communications hardware and cables to be useful for anything but niche applications? The future is mobile, always-on, embedded computing devices. Any security for those will necessarily be software only. There’s one more future scenario to consider, one that doesn’t require a quantum computer. While there are several mathematical theories that underpin the one-wayness we use in cryptography, proving the validity of those theories is in fact one of the great open problems in computer science. Just as it is possible for a smart cryptographer to find a new trick that makes it easier to break a particular algorithm, we might imagine aliens with sufficient mathematical theory to break all encryption algorithms. To us, today, this is ridiculous. Public- key cryptography is all number theory, and potentially vulnerable to more mathematically inclined aliens. Symmetric cryptography is so much nonlinear muddle, so easy to make more complex, and so easy to increase key length, that this future is unimaginable. Consider an AES variant with a 512-bit block and key size, and 128 rounds. Unless mathematics is fundamentally different than our current understanding, that’ll be secure until computers are made of something other than matter and occupy something other than space. But if the unimaginable happens, that would leave us with cryptography based solely on information theory: one-time pads and their variants. This would be a huge blow to security. One-time pads might be theoretically secure, but in practical terms they are unusable for anything other than specialized niche applications. Today, only crackpots try to build general-use systems based on one-time pads — and cryptographers laugh at them, because they replace algorithm design problems (easy) with key management and physical security problems (much, much harder). In our alien-ridden science-fiction future, we might have nothing else. Against these godlike aliens, cryptography will be the only technology we can be sure of. Our nukes might refuse to detonate and our fighter jets might fall out of the sky, but we will still be able to communicate securely using one-time pads. There’s an optimism in that. This essay originally appeared in IEEE Security and Privacy.